Canadian Daily Deals: Swagbucks Swag Code Extravaganza: Reindeer Games! 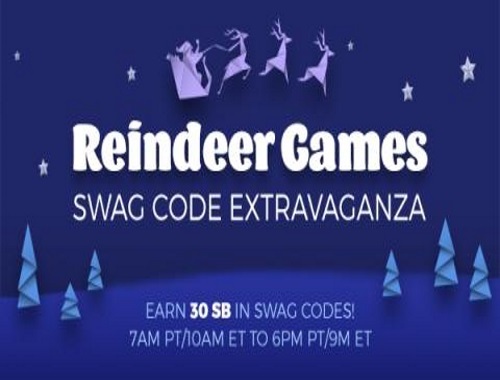 Swagbucks Swag Code Extravaganza: Reindeer Games! I love when Swagbucks has Swag Code Extravaganzas, they are one of the easiest ways to earn SB! What are SB you ask? SB are points you earn on Swagbucks, a website where you can get gift cards for the things you do online - I've gotten lots of Paypal money with Swagbucks! What are you waiting for? The holiday cheer begins on Wednesday, December 21 from 7am PDT/10am EDT to 6pm PDT/9pm EDT. All you have to do is look out for the Swag Code notifications, enter the code, and you earn SB (which can be redeemed for gift cards)!